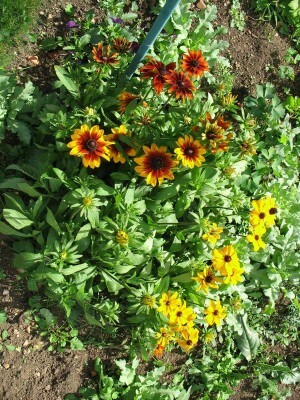 I have not grown many annuals as I haven’t had the space before, but this year I have started a new bed after getting rid of couch grass, and as well as the herbs that were planned to go in I put some rudbeckia ‘Rustic Dwarf’ from seedlings bought at our village plant sale. 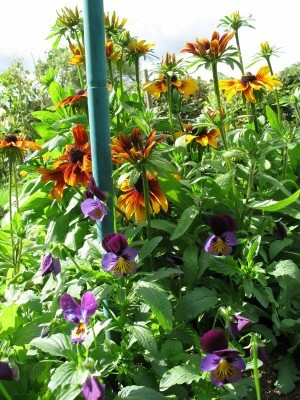 I’m very glad I did – they are practically the only things in flower now! And they go beautifully with the violas which have self-seeded next to them. 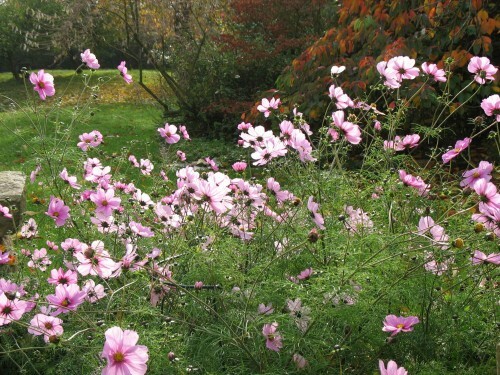 The other annuals I usually grow are cosmos, as they will flower from July until the frosts – here is a photo of some magnificent cosmos in my sister’s garden. I have also grown calendula in the past, and they have self-seeded in my front beds next to a deep red sedum to good effect. 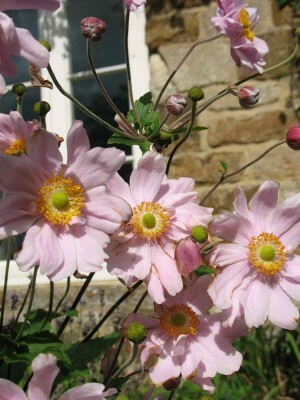 and of course Japanese anemones. 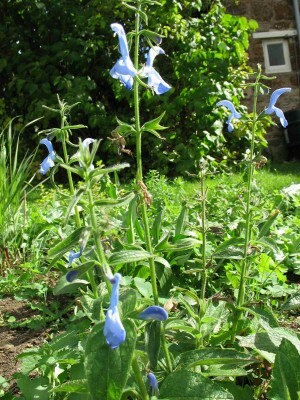 I’ve planted some penstemon plugs from a Gardening News offer, which will be in full flower this time next year: Raven, Garnet, Apple Blossom and Snowflake. More of all of these next year! In another bed is Aster lateriflorus ‘Prince’ with great purply-red stems and leaves. This will be flowering soon, in front of the Helianthus ‘Lemon Queen’ which is a great low-maintenance autumn flowering plant: it is sturdy, needing no staking, with good leaves and a long flowering season. 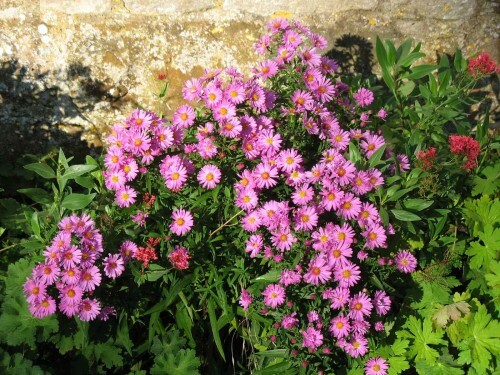 My favourite aster is ‘frikartii Munch’ which I don’t have at the moment. The nearest I have to it is aster amellus ‘King George’ which has at last flourished amongst the rampant geraniums in front. Also in front are the fuschias; as the Independent says, these are much-overlooked and lovely this time of year. Even if the climate is not mild enough for these to survive over the winter, they will die down and come up next year very reliably. 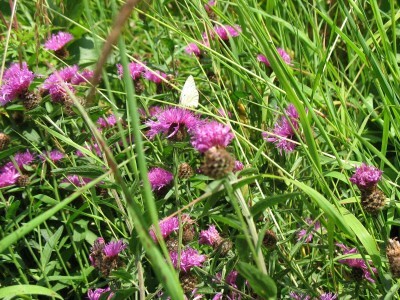 Another type of plant overlooked for late summer/early autumn colour is knapweed, centaurea nigra. 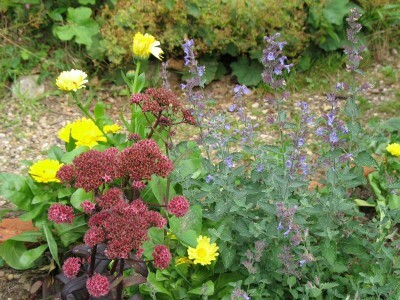 This started flowering in July and another large clump is flowering now in my meadow patch. It’s covered with bees and hoverflies. There are so many other plants in flower at this time of year and I want to get more of them: gaura lindheimii, which has beautiful delicate clouds of white flowers; dahlias and lobelias, agapanthus and eryngium. Now that climate change has lengthened our growing season, this month can become another peak flowering time in our gardens.